Has the PSI of your pool pump and filtering system gone haywire? Is your water cloudy? If so it is likely time to clean your filter. Our pool filter cleaning service will get things back to normal quickly. The pump and filtering system of your swimming pool and spa are the heart of keeping them clean. In normal operating circumstances, all water in your pool is pushed through the filter ever 24 hours or once a day. The filter allows water to pass through while catching all other materials. Over time, however, the amount of trapped dirt, particulars and other materials in your water will accumulate, and eventually reach a point where your filtering system is no longer working as it should be. Dirt, hair, debris, oils from suntan lotions, etc. will have built up to a point of clogging the filter. This causes the water circulation to slow and the system to work inefficiently. For this reason keeping your filter(s) clean is an essential aspect of keeping your pool. Let us put our years of experience working with thousands of Las Vegas pools and spas to work for you. If it's time to clean your filter Summerlin Hills Pool Service is there. 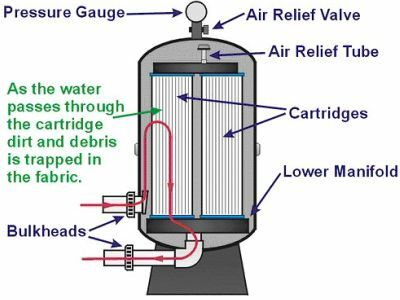 Cartridges are the most common type of pool filtering. Made of a fabric very similar to what is in your automobile, water passes through but dirt, debris and other substances are captured as the clean water is pumped back out. While they can be expensive to replace, their life can be extended by cleaning them. If your water circulation has grown too slow, and valve pressure too high above normal, it's time for a filter cleaning. We will remove the cartridges, clear them of large debris such as leaves, hair, bugs and wash down the filtering fabric removing all of the smaller dust and dirt particles. Once they are put back your system will be operating "swimmingly" once again. In a sand filter system, pool water is pushed at high pressure through a sand bed, which captures dirt, debris and particles as water passes through. Clean water is then pumped back out into your swimming pool. Backwashing is a maintenance operation that should happen regularly when flow slows down and pressure rises. When an ordinary backwash just isn't good enough anymore, a more thorough cleaning may be required. D.E. (Diatomaceous Earth) filters are highly efficient, capable of capturing dirt and particles in your pool water as small as 5 microns (roughly 1/10th the width of a human hair). They are also relatively low maintenance, requiring only the normal backflushing and reloading of the D.E. or Fiber Clear powder once a month or so. Once a year, however, and possibly more often depending on how clean you regularly keep your pool or how often it gets used, surrounding trees and landscape, etc. you do need to disassemble and clean the entire unit and filtering grids. We can help you by . . . Thoroughly cleaning all of the assembly parts, filter housing, etc.